Specialize in Wedding Receptions - See below for an overview on my standard wedding reception price and service. 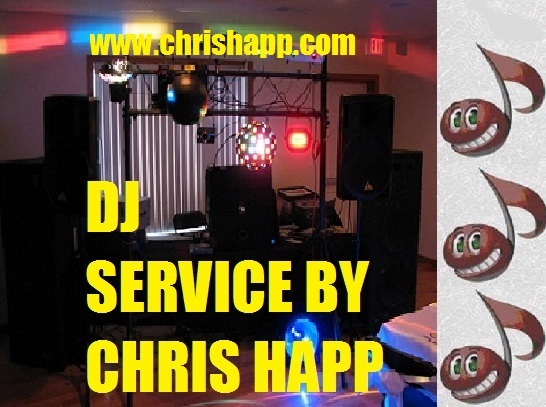 My cost in 2019 for my DJ Service at a wedding reception is $800.00. By popular request I will continue to offer Ceremony Sound and Reception Service as long as BOTH events take place at the same physical location. Cost for Ceremony & Reception is $950.00. Ceremony provides wireless microphones for officiate, singers, and live instruments. Every reception is un-timed and covers the entire event, not for a limited number of hours. I arrive 2 hours before the first guest. This allows me ample time to setup light show, sound equipment, complete sound checks, and be in my tux/suit before first guest arrives. If the party is rolling and the venue allows I will continue to play beyond the scheduled "end time" at NO ADDITIONAL COST. I require a $250.00 deposit required to “book” your date. This deposit is part of the package price, not in addition to it. My preferred method of deposit payment is through my website. I provide a secure link through PayPal, you do not need to have a PayPal account to utilize this service, I can email you instructions if requested. Customers can pay the deposit or make event payments through the "Make a Payment" link once they log into their event on the website. If paying by check, I request the check be issued to Chris Happ, feel free to put Happy Productions or DJ Service by Chris Happ on the memo line. I will provide my mailing address upon request. A face to face meeting works well both initially to go over my services, ask questions, go over pre planning forms, etc. Once booked I like to have a final face to face meeting about a month out. I have found this helps all know that we are on the same page :-) We will go over song selection, timeline, and final details at this meeting. Every wedding reception includes dinner music, cocktail music, grand entrance, special dances, reception dance, a complete professional light show, a professional sound system with a complete back-up system, wireless microphones for the head table and toasts. With every event I bring back up equipment -microphones, amplifiers, and speakers. All wedding events are UN-TIMED. I do not charge by the hour! If your beginning or end time should change the price will not. I will be set up, sound checked, microphones tested, and in my tuxedo/suit before the first guest arrives. Set-up time takes about 2 hours, tear down generally is an hour or less. With providing un-timed/event pricing you do not need to worry about paying for time required to set up or tear down or how long the actual "music" time - (dinner music and dance) takes. I require the remaining balance be paid prior to the date of performance prior to setting up. In my experience over the years I have found it to be to awkward to try and collect the final payment immediately before or during the actual performance. Thank you to all the customers in which I have been blessed to help in your celebrations over the past 16+ years!